Levi’s Stadium – Santa Clara, Calif. This was the final that was not expected by any of the media pundits. They did not expect Jamaica to be in the final. That is understandable though, Jamaica’s Reggae Boyz came into the final with none of their established leaders or stars and had a starting team that mainly had either been on the bench that last Gold Cup run or had not even been on the team. Whereas Mexico and USA who have been the longstanding giants of Concacaf were expected to be the finalist. The two giant countries; more resourced, experienced and with decorated players had been the script and narrative to be the finalists. Jamaica has shocked the football world by making it to the finals, again. We will see who comes out as the victor tonight! Jamaica defeated Canada 2-1 to advance to the semi-finals of the 2017 Gold Cup Football competition. In a game that was filled with energy and Jamaicans bringing a fast pace streaking to Balls at any opportunity, Jamaica won the entertaining match to advance. Jamaica goalie Andre Blake did a magnificent job of keeping the northern rivals at bay. The Reggae Boyz got a great start when Shaun Francis (pictured above) received a perfect pass from Darren Mattocks to convert for the 1st goal. At the beginning of the 2nd half prolific scorer Romario Williams put Jamaica in a comfortable lead after Mattocks sent him a pass that he capitalized on and put Jamaica up by 2 goals. Jamaican-Canadian Junior Hoilett scored a goal for Canada with 30 minutes remaining in the game. That gave Canada new energy as they stepped up the attacks. The Jamaican defense anchored by goalie Andre Blake would not allow any more goals. Jamaica will face regional giant Mexico in the semifinal of the Football Gold Cup 2017 competition. Canada has been eliminated. Friday the 7th of September 2012 will go down in Caribbean sports history in infamy. On a lukewarm evening in Jamaica at Independence Park, also known as the National Stadium and popularly known as the “Office”, The US national football team lost for the first time in 43 years to a Caribbean team in a game that mattered. Jamaica’s Reggae Boyz had defeated the regional super power after 90 minutes of solid play, scoring 2 goals to 1. There were immediate celebrations at the stadium, throughout the city of Kingston, throughout Jamaica and several places in the Diaspora wherever Jamaicans were. The Euphoria extended far and wide as social media and other internet manifestations were ablaze with celebratory posts about the game. You ask yourself why this was so important and we are not even in the final stage of the World Cup in 2014, much less in the finals? Well to answer that question one has to look at various factors. • In 18 tries Jamaica had never won over the US. There were several draws through these periods. • Of the roughly 40 countries in the region, the United States has perennially been the number 2 team behind Mexico (One of the World’s best teams). • The US put and has considerable resources to put towards their football program which creates platforms for raising the quality of the team. There is no other country in the region that has the ability to throw such resources to their football programs. The US being an economic powerhouse gives the country an extreme advantage to draw and naturalize some of the best players in the world, pay some of the best teams to play against their team to elevate the quality of the National side, and to build a powerful football program from the ground (children) up. • Also on the Jamaican side the coach Theodore Whitmore and most of the players come from very humble beginnings and became stars in Jamaica and not outside Jamaica, showing that the little island is able to produce international level competitors and does not need to depend on the outside. • And yes 2012 marks Jamaica’s 50th Year of Independence. Also the game follows a historic performance by the Jamaica Olympics team in the London Olympics of 2012. As such we are going to hear the saying “David slays Goliath”, “Small Axe Falls Big Tree” and of course “we might be small but we Tallawah”! The US was without a couple of their stars, but so was Jamaica. The US still had Tim Howard, one of the best goalies in the world and Clinton Dempsey who turned out to be one of the best scorers in the world. As for Jamaica, Luton Shelton is a home grown scoring machine who scored the winning goal with Rudolph Austin who scored and destroyed the mid field. Goalie Dwayne Miller needs special mention for great play. In terms of the rest of the round Jamaica plays the United States on Tuesday September 11, followed by Antigua & Barbuda and then Guatemala. We should survive and advance. However whether we win or lose the next US game we must never forget how special and beautiful this victory at home over the US was. 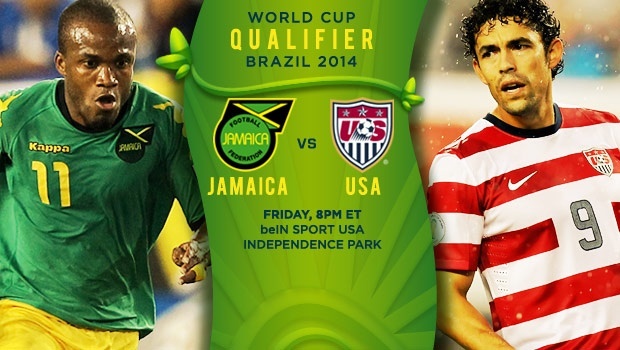 In a David vs Goliath clash Jamaica is taking on the one of the region;s powerhouses in Football in the US. The game will be played at home in the “Office” AKA the National Stadium Today Friday September 7. This is a World Cup Qualifier where Jamaica is tied atop their group with the USA. Darren Mattocks, the most exciting first year player in the MLS and the man considered the leading candidate for rookie of the year award in the league, was yesterday named to a Reggae Boyz squad of 24 for an encounter with the United States in group World Cup qualifier at ‘the Office on Friday September 7. The soon to be 22-year-old made his national team debut on August 15 in a friendly international against El Salvador coming on as second half substitute in Jamaica’s 2-0 win. While he did not find the back of the net Mattocks, has an excellent record as a goal scorer, finding the target 39 times from 47 appearances for Akron University over a two-year period. His outstanding performances saw him being drafted by the Vancouver Whitecaps in January with the second overall pick in the 2012 MLS SuperDraft. The skillful and speedy six-footer has not disappointed scoring seven goals in 13 games, the most for his team and the most as a rookie. He has taken the second most shots for his team and has 14 shots in all on goal for a conversion rate of 50 per cent of shots on goal. Also included in the squad is the country’s new central defensive pair of Reading’s Adrian Mariappa and Watford’s Nyron Nosworthy. Both played together at Watford before Mariappa’s off-season move to the Premier League club. Both made their national debut together in a 1-0 win over Guyana at the Catherine Hall Stadium. This encounter will mark their fifth game together for the country. Rodolph Austin, who earned the status of cult hero after just one game for Leeds United with a performance which saw him bossing the midfield breaking up tackles, spraying passes forward and testing the opposing goalkeeper with a few long-ranged shots, is also included and is expected to be the engine of the team’s midfield. The Turkey-based Luton Shelton after his double strike against El Salvador, his first goals since the Gold Cup last June, should be full of confidence and eager to extend his record as the country’s leading scorer. His partnership with Ryan Johnson, the man who assisted on both of his strikes against El Salvador should also serve the team well. Jamaica are seeking to take over the leadership of group A as despite the fact that both teams are on four points after two games in the four-team group, they are being edged out of first place by the United States which have a superior goal difference. KINGSTON, Jamaica – Winless in 18 tries against the United States, Jamaica is determined to see that streak end – and do it in World Cup qualifying. Tied with the Americans atop Group A in the CONCACAF semifinal round of qualifying with four points apiece, Jamaica can also boost its chances of reaching the final round of qualifying with a win Friday night. The U.S. limps in without two key players, midfielders Landon Donovan and Michael Bradley, and their most dangerous attacker, Clint Dempsey not match fit. It only adds to the Jamaicans’ confidence. “Even if those guys were in the lineup, I still think we can beat them,” Jamaica striker Ryan Johnson said. “They’re human, just like the rest of us. It’s all about the team that comes out to play on that day because anything can happen. In fact, the Jamaica feels this is its time to qualify for their second World Cup, joining the group that went to France in 1998. Forward Omar Cummings said coach Theodore Whitmore has prepared the team for this moment. “A lot of people don’t recognize with what we’ve done or the accomplishments that we’ve made over the last couple of years,” he said. 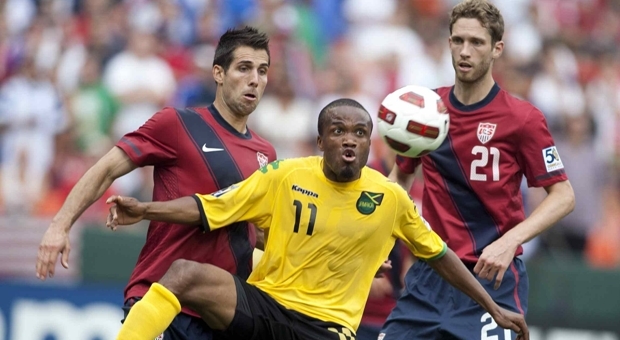 For the Americans, they have never won a qualifier in Jamaica, trying all four matches – including three goalless draws. The last time these two teams met, the United States won 2-0 in the 2011 CONCACAF Gold Cup quarterfinals. A win would help the Caribbean side in many ways, from confidence to being more settled for Tuesday’s rematch in Columbus, Ohio. It also would have some ancillary benefits. “It would be a gift for us to celebrate our 50th year,” Whitmore said, referring to the 50th anniversary of Jamaica’s independence from Britain this year. Anniversary celebrations were held at National Stadium, the Reggae Boyz’ home field, which is better known to fans as The Office. The Jamaicans held a 50-game unbeaten streak at the stadium from 1995-2001 and opponents still find it a difficult place to play.